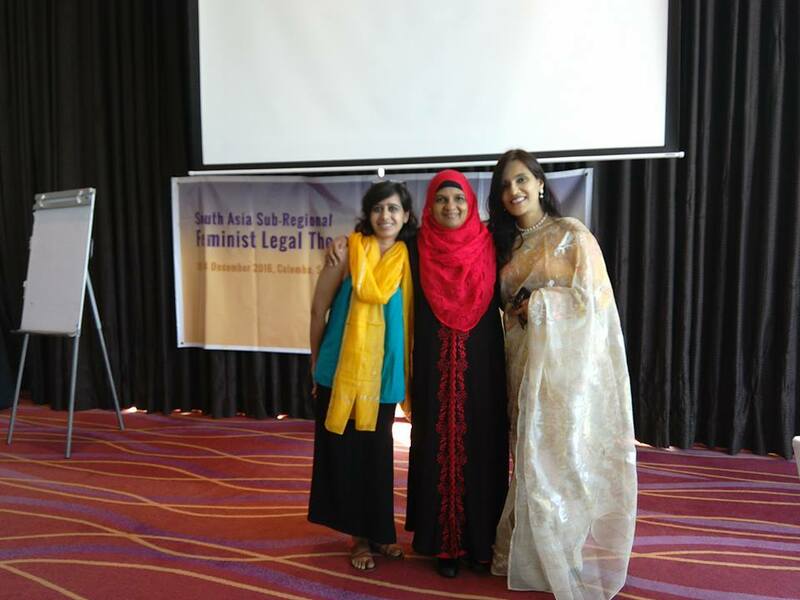 Fathimath Afiya (middle) was in South Asia Sub-Regional Feminist Legal Theory and Practice workshop. This August, ACCCRN Network interviewed her on her role as a gender consultant and the role of women in the Maldives. As research indicates, during any disaster the people most affected are the women, children, people with disabilities, and the elderly. In an urban context what is the relationship between gender and urban climate change resilience to you? Why do you think it is important? The impact on vulnerable groups was clearly highlighted, during the 2004 tsunami ; one of the biggest disasters to have ever hit South Asian countries, and which claimed the lives of thousands of women and children in larger numbers than men and caused great losses across the affected countries. For this reason, it is essential that the national, regional and international policies and instruments ensure and guarantee the equal full participation of women and focus on reducing the gender inequality. Urban climate change resilience will not happen meaningfully without the full involvement of women, who are sidelined during decision making and the implementation of climate change resilience programs. In urban climate change, women play a crucial role as powerful leaders in protecting their families and their livelihoods to build strong resilient communities. Women can be the strong characters who are central to holding communities together for the protection of human rights of the whole society, although half the time, the work of women is clearly not recognised or acknowledged. The voices of women are important to bridge the gap in gender inequality to develop urban climate change resilience communities in South Asia. Can you share some examples of the crucial role of women as powerful leaders? I have been involved in the Tsunami Management Team of Action Aid International’s (AAI) Rehabilitation and Reconstruction program that covered five countries: India, Maldives, Sri Lanka, Thailand, Indonesia and Somaliland aftermath the 2004 tsunami. The learning from this is that AAI focused on providing rehabilitation in different thematic areas and one of them was to focus on providing assistance to women. During this cross-country program, the focus was on empowering women through capacity building, assisting with the documentation of the key issues in the communities, developing local, national and international women’s networks, some of which are still active. The national NGOs in urban areas work with local communities and this network helped to build resilient communities in many countries. Another important lesson learned from the AAI program is that documentation is crucial to understanding the challenges and gaps that exist so that it will assist the policy makers and community leaders to make informed decisions. I am the Chairperson of the Maldivian Network for Empowering Women (MNEW), which was established as an informal network during the AAI work in the aftermath of the tsunami in 2005, thereafter registered officially in 2012. MNEW focuses on capacity building for women and families engaging in advocacy and policy work at the local and national level. Presently, MNEW is in the process of establishing a regional network in collaboration with five other NGOs in South Asia. You are a gender consultant; can you tell us more about your work? Could you please tell us about gender roles and urban climate change resilience in the context of the Maldives? Malé, the capital city of Maldives, with its 153,904 residents, or 38% of the country’spopulation, is one of most densely populated cities in the world (Census 2014 p33). This is disputed by the Maldives immigration office who claim that an extra 60,000 expatriates are living in the city. The Maldives rely heavily on an expatriate labour force specifically in some of the technical area and less professional areas. This huge population living in the 5.8 km2 capital is causing huge problems. There is an increase in the number of motorcycles, cars and other heavy vehicles. Sometimes we find it difficult to walk on the narrow pavements which are specifically difficult for children, women, and people with disabilities. Census 2014 shows that there were 68,208 registered vehicles with 5,710 motorcycles. In Malé city, you can observe, row and rows of motorcycles parked everywhere and even on the pavements. The Maldives need to focus on establishing a public transport system to reduce the emissions that cause air pollution. The soil and the groundwater in Malé, and even the big cities on other atolls, have been contaminated by the resident population, due to the lack of sewage facilities. Hence, we are forced to rely on large amounts of imported mineral water. In 2014, a total of 4,845,906 litres of mineral water were imported to the Maldives. Most Maldivian families do not trust the tap, groundwater or rainwater and now the trend is drinking mineral water. In the year 2014, a fire started in the only water desalination plant in Malé. This led to panic buying and a water shortage in the capital city Malé. This is one such example that could create havoc and greater losses if not addressed early on. I was involved in stakeholders meetings and it became obvious that the urban areas in the Maldives, especially the capital city, were not prepared to handle this type of huge disaster. The government did its best to ease the public fears and immediately established mechanisms to control the available drinking water and imported stocks of water. However, it became obvious that the needs of the vulnerable groups, like pregnant women, women with disabilities, and others, were groups that were hard to reach. With pressure from NGOs, a separate help desk was set up for the vulnerable groups but there were still problems with the way things were organised. My experiences indicate that there should be the empowerment of women and other vulnerable groups who should be trained to handle and be engaged during disasters. Also, a mechanism needs to be established beforehand otherwise responses to disasters will have gaps and challenges that could be avoided if the local communities are made resilient. In the context of Asia, how do you see gender and urban climate change resilience? How to motivate people to play a part in fostering gender equity? I think the governments miss out on addressing the issue of gender equality in the context of climate change. In various national and international forums that I have attended, the call has been to engage civil society organisations more in the work of climate change at the decision making level. In this engagement, effort should be made to include the voice of women and people with disabilities. I am a believer in systems and mechanisms at the national, regional and international levels of development that focus on providing equity. The national and international policies and instruments should guarantee the inclusion of the voices of both sexes to have an equal say. Unfortunately, in the major decision-making forums at the national and international gatherings, we still witness to a large number of men speaking on behalf of women and the vulnerable groups. All efforts and enforcement should have to involve an equal number of women who themselves can understand the problems and challenges that face the vulnerable groups. As I see it, all policy documents should have statements that engage civil society, women and other vulnerable groups as part of the disaster preparedness plans and in planning resilient communities. Is there any message that you want to emphasize to the network regarding gender and urban climate change resilience? I would like to see the real situation of the engagement of women in planning. It’s only recently that we have started talking about letting women participate in tackling climate change. I would like to see research in this area to let us make informed decisions. I am sure we would have some interesting findings for policy making decisions that would indicate that we need to put in more effort into engaging women in urban development planning or climate change. Dollar, D., & Gatti, R. (1999). Gender inequality, income, and growth: are good times good for women? (Vol. 1). Washington, DC: Development Research Group, The World Bank. Cohen, B. (2006). Urbanization in developing countries: Current trends, future projections, and key challenges for sustainability. Technology in society, 28(1), 63-80. Page generated in 0.31 seconds.